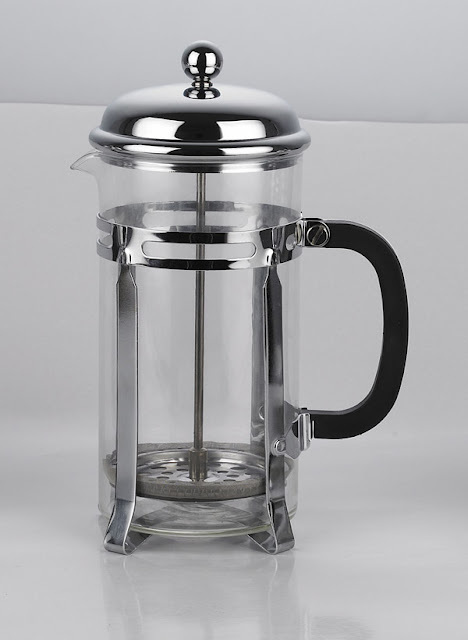 I like to prepare my morning coffee in a traditional French press pot – Bodum makes a high quality pot (I’ve had the 4-cup model for about 5 years and it’s worked great) or a Clever coffee dripper. Grinding your own beans is also essential. Burr grinders are ideal (they grind beans in uniform size) and I use the inexpensive but highly functional Hario slim mill to grind my coffee beans. The Hario produces and even grind and will elevate the way your coffee tastes. Two tablespoons of coffee for every six ounces water. Once your water has finished boiling (I use the Krups Electric Water Kettle and it boils water in record time, plus it’s an energy saver versus using your gas or electric stove! ), poor the water directly over the ground beans. Place the lid on the French pot but do not plunge the filter mechanism down. Let the water and beans sit for about 4 minutes. 4 minutes is perfect for extracting all of the good flavors out of the bean. Once the time is up you can gently plunge the lid and enjoy your first cup! Thanks for all your posts regarding coffee! I’ve learned a lot from you and therefore saved money by making better coffee at home. I have especially liked making french press coffee – after reading your instructions, I finally put to use a french press that had been a Christmas present many years ago. My question is this: how do you clean your press? What do you do with the grounds (do they go in the garbage disposal, wastebasket, garden…? Do you use soapy water or just plain hot water to clean the parts? How about cleaning and maintaining other coffee appliances/tools like espresso maker, grinder,…? I am a fan of your blog – you’re doing a good job! Also, congratulations on your new adventure into parenthood – enjoy! Thanks, Lois! Cleaning the french press is fairly easy. First remove the press device and rinse it over cold water in the sink (I like turning the handle so that the grind come off the filter). Then fill the glass container with enough water so that the old grinds are covered and then simply dump into your garbage or if you have a backyard through into your soil (it makes for great compost material). I like to clean with soap every week or so. You can use a brush to clean your coffee grinder (don’t use water). Thanks for reading the blog and the congrats on the new baby! Thanks for the reply, Vince! I appreciate the tips. My husband recently got out our little percolator that we used for making coffee over the fire when we went camping. We haven’t gone camping for a few years but he wanted to try that percolator on the stove. It was good! Now we have one more method to use once in a while. It’s interesting how each method has its own charms. I bought a Gaggia coffee machine a while ago. I use it really often and it produces really nice tasting coffee.